Disclosure: Our hotel accommodations at Wilderness at the Smokies, along with our water park and indoor activity tickets, were provided by the resort. As always, all opinions expressed on my blog are mine and I am under no obligation to write a positive (or negative) review. A family weekend getaway where everyone has their pick of fun, whether it’s more on the go or relaxing? I’m there! 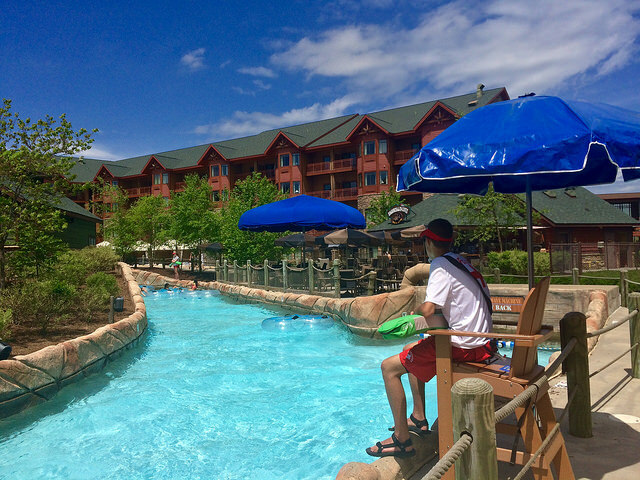 We recently had the chance to explore all the fun for the entire family at Wilderness at the Smokies in Sevierville. 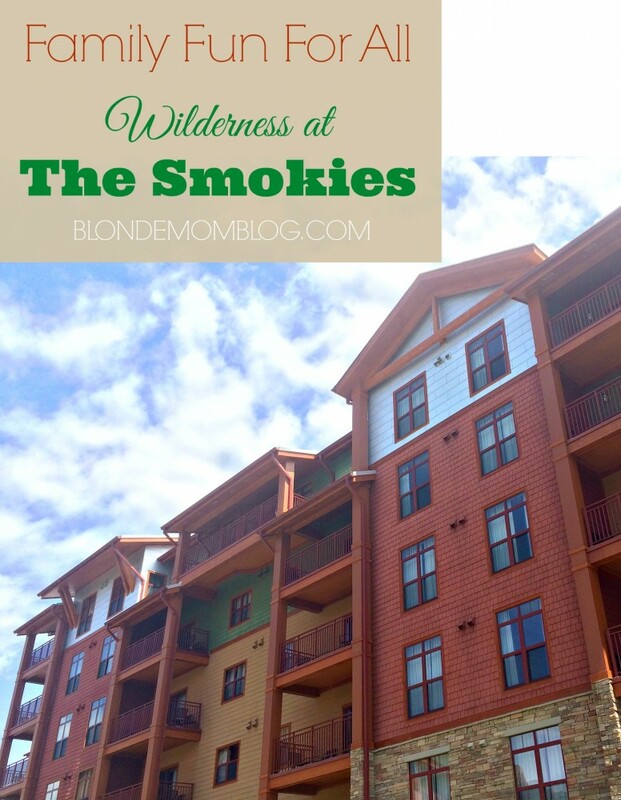 We’ve driven past the Wilderness at the Smokies resort a few times on our way to the Smokies and we’ve always had it on our must do family weekend fun bucket list. Wilderness at the Smokies is the largest indoor waterpark in Tennessee. We arrived late on a Friday evening and we were excited to check out our room, which was perfect for our family. Featuring a queen-size bed and fold-out sofa on one side, and a full-size bed with a bunk overhead on the other side, we could keep the kids somewhat separated from the adults which is always great if some in your travel entourage like to wake early and some like to sleep in. Our bunk suite room was cozy and compact, but we were rarely ever in our room as we were having too much time exploring the two waterparks and the indoor Adventure Forest area. Some other bonuses in our room that we loved: mini fridge, microwave, a coffee maker, and a private balcony. Saturday was our first full day at the park and my almost teenage daughter was talking about Starbucks (available in the snack lounge just off the main lobby) as soon as she woke. I took my younger daughter (age 10) and her friend down to explore the Adventure Forest area first thing. This is a 25,000 sq. ft. indoor, dry family adventure center. There are two types of passes for resort guests: all-day and all-stay. Our reservations included the all-stay option which was great as we were able to enjoy the area on Sunday morning before departure as well. My husband and younger daughter braved Tree Top Towers, a three story ropes course, and I actually conquered my fear of heights and tried Mount Wild, the rock climbing wall! There are tons of arcade games, a mini bowling area, laser tag and all sorts of fun activities to keep your kids occupied for hours. For younger kids there is also a large indoor playground structure. One thing to note is that the cost of arcade games is not included in your Adventure Forest ticket. This wasn’t really of any concern to us, however, as there was more than enough for the kids to explore. We did play a new Star Wars video game, however! After checking out the dry indoor area, it was time to throw on our swimsuits and check out the indoor and outdoor water area. The weather forecast was predicting rain for the entire day Saturday but we truly lucked out. The morning was overcast, but by 1 p.m. it was absolutely gorgeous. We tried several of the waterslides, actually I should say my family did…I ended up closing out Saturday night on The Runaway Canyon, a five-story-high family raft ride that ends with a drop of almost 60 feet! Somehow my family convinced me that it was the mildest of the indoor slides and compared it to the lazy river. Um yeah. Actually I am a huge, huge wimp but it was a blast and yes it was one of the tamer indoor water attractions! My braver better half tried the Storm Chaser Thrill Ride and pretty much all the water slides! 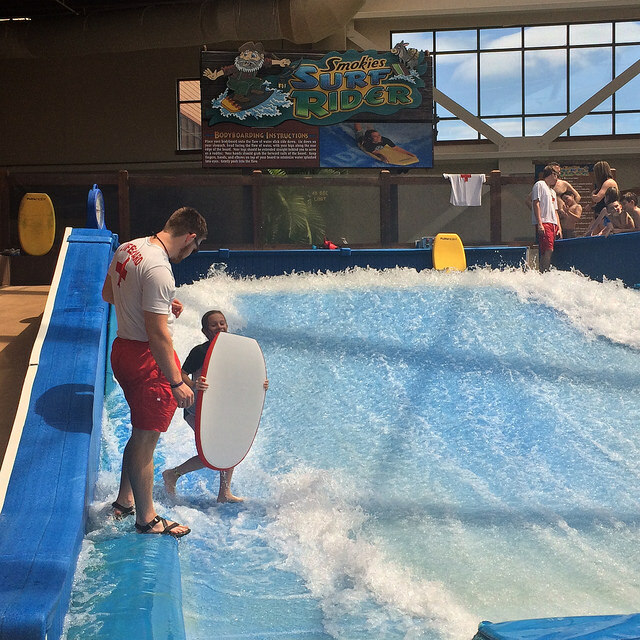 Both my husband and my 10-year-old daughter tried the Smokies Surf Rider. It looked like fun, but also a lot of work, so I passed on that attraction. I loved how the staff lifeguards worked with my daughter to share pointers. Once you’ve had enough thrill-seeking for the day, you can head to the Magnolia Grove Hot Spa, an 1,000 square foot family hot tub with access from both the indoor and outdoor water park. One other definite wow factor to the indoor waterpark is that it is a pleasant 82 degrees year round. If you’re headed to the waterpark in the fall or winter, don’t disregard the sunscreen as the Foil Tech glass roof allows sunshine in, enabling you to get your tan on year round! Yes, this is my husband! The lazy river was much more my speed. The water was still chilly for April, but check out the gorgeous weather. We couldn’t have planned a more beautiful day to spend outdoors! I also loved the outdoor snack bar area and my younger daughter loved the outdoor wave pool (there is a second wave pool indoors as well.) I also loved the cabanas you can rent, which would be ideal during the extreme heat of July and August. We basically spent the day outside, but ventured back into the indoor waterpark in the evening and basically closed it down! 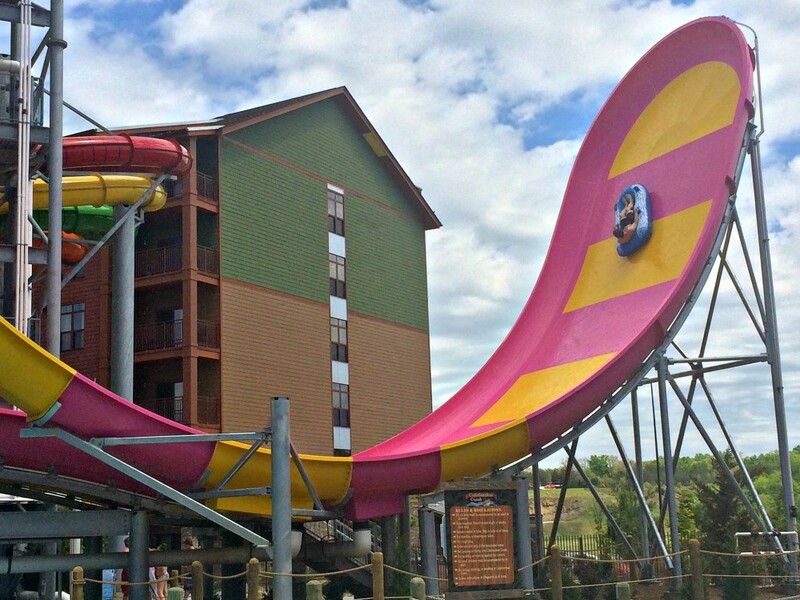 The weekend came to a close on Sunday but the great thing about staying at Wilderness at the Smokies is that you can continue to enjoy the waterparks after you’ve checked out of your room. We decided to hit the indoor activity/arcade area one more time before heading home. Check the traffic report. We hit zero traffic on the way home to Nashville, but the drive out Friday afternoon took much, much longer than we anticipated. Pack bags for wet swimsuits for departure day. Check all of the height and weight requirements for attractions. Wilderness at the Smokies was absolutely ideal for my tween daughters ages 10 and 12 (and their friend who is 9) but there are attractions for little ones. Rent a storage locker for your gear. It’s definitely worth it. Speaking of gear, do not leave your towels anywhere near Washout Mountain, even on the nearby chairs. We learned the hard way, before renting a locker, that anything you leave out will get soaked from the giant water bucket. Nothing was ruined, thankfully, but my daughter’s Converse were soaked for the remainder of the trip. Save space in your suitcase and leave the beach towels at home; your waterpark tickets include towels and you can trade them in throughout the day for dry towels. Pack snacks to keep in your room. I also packed breakfast items and we picked up milk for the kids to keep in the room mini fridge so they could eat before we headed down for the day. We ended up eating dinner off site both nights, but kids 11 and younger eat free with the purchase of an adult meal at the resort’s breakfast or lunch buffet. Check out the resort specials online as they change often (and military families get 10% off). Be sure to also follow Wilderness at the Smokies on Facebook. They post a lot of great content and updates on specials and attractions. Was Wilderness at the Smokies a hit with my family? Yes! It’s truly one of those weekend vacation spots where there is something for everyone. You can also park and stay the entire weekend on property without ever leaving! My younger daughter actually told me she enjoyed it more than Disney World. 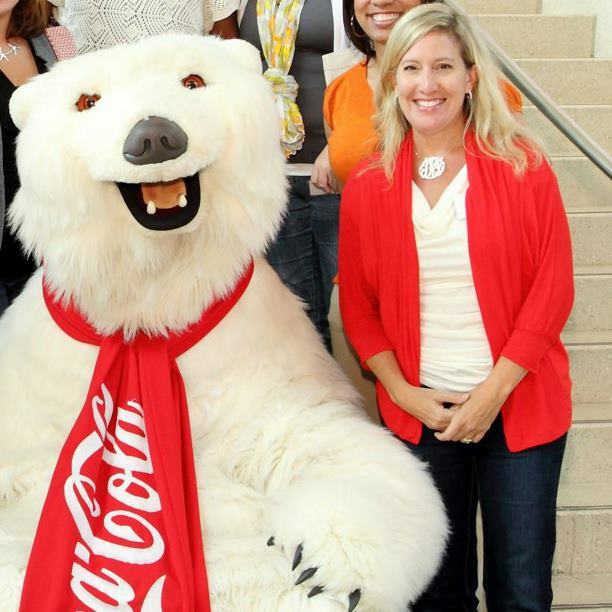 Sorry Mickey…you’ve got a little competition in East Tennessee. This entry was posted in Travel and tagged Gatlinburg, Pigeon Forge, Sevier County, Sevierville, Smokies, travel, Wilderness at the Smokies. We are planning to go there this fall with our family. I love waterparks and am just so excited! Great review! I want to take my daughters there this Summer. Thanks for the helpful tips!